The blog hasn’t seen much updating lately, but that’s because I’ve been out taking in tons of new material! A most recent example is this shot from a backpacking expedition to the Big Pine Lakes area in the Eastern Sierras. 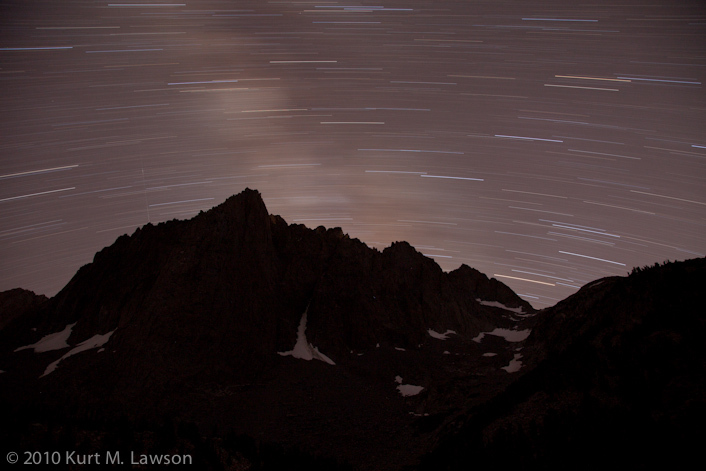 Here is a 30-minute long exposure of the incredibly beautiful Temple Crag. Despite pointing my camera in almost the exact opposite direction from the constellation of Perseus, the point from which Perseid meteors seem to originate from, I managed to capture one stray behind this striking mountain. The sole vertical line on the left side is the captured Perseid. Freddy Oropeza - Nice Pic, you should enter one of these in the Canon in the Parks contest. admin - Oooh thanks for reminding me of that. I will try not to miss the deadline this year. This pic unfortunately won’t qualify for that contest since it’s in the John Muir Wilderness, and not a park. © 2012 Kurt M Lawson Photography. Kurt Lawson is a participant in the Amazon Services LLC Associates Program, an affiliate advertising program designed to provide a means for sites to earn advertising fees by advertising and linking to amazon.com.|ProPhoto Blog Template by NetRivet, Inc.